Frankenstein and Dracula are two of the most recognized and most retold stories out there. And yet they're also two of the stories whose retellings most differ from their novels. They've become mythology, mythology based on images and horrors and not so much on themes and possible messages. I must admit that I haven't seen very many versions of Frankenstein--or at least it would seem that I haven't. Even if I've only seen one or two movie versions of the story, it makes its way into all sorts of TV shows and other forms of media. It's in everything from Once Upon a Time to Looney Tunes. And we all know what the old black and white Frankenstein looked like, even if we've never sat down to watch the whole thing (I have seen the old, old Dracula, though, by the way). So the imagery is there in our minds. Sometimes it's easier to watch new things that come up than to go back and watch all the old things. Hence my curiosity for last year's Victor Frankenstein, starring James McAvoy and Daniel Radcliffe. Maybe I was also interested because I do see a lot of James McAvoy's movies--and I usually end up liking them, in some form or other. The beginning of the film was, perhaps, the most interesting. In fact, I think you can roughly divide this movie into two parts: the new and the old. The first part (I can't say the first half because I'm not positive if the division was near the halfway point or not) is a rather new take on the classic story. And yet it is a new take that displays quite well the themes that I remember engaging with when I read the novel. It's as if the filmmakers removed the skeleton of the story, inverted it, and placed it back in--and I love that sort of approach when it comes to classic stories. Frankenstein is not just about creating a monster; it's about becoming a Man. Dr. Frankenstein creates the flesh of his "monster," but that creation then goes through a process, on his own, of learning to speak and to read and to think and to create himself as a person. It isn't so much a horror story as a philosophical one. The film takes that concept of creating a person and gives it to Igor. He begins as nameless, a disrespected and unvalued part of a circus show. Frankenstein, on seeing his aptitude for and grasp of medical science, rescues him: he fixes his physical abnormality, he feeds him, he clothes him, and he gives him a place to live and work. Through this, Igor gains a sense of self that he never had before, until he is finally able to make his own choices and choose his own life (even his growing relationship with Lorelei reflects the monster's desire for a companion). That is the Frankenstein story, and that was the best part of the movie. The thing is, the themes with Igor are starting to mostly wrap up well before the movie is over. This is where the old comes in, that is, the standard imagery that we're all used to. The old castle, the rain, the lightning, the machines, the monster, the mad doctor. It's all there. And while it does have a different spin to it given the themes that have already been presented, well, this part of the movie was just less interesting than the rest. It's as if the filmmakers started telling a story and they were forming it very well from their minds onto the screen--and then they suddenly remembered to make it look familiar. The question is, did it have to look familiar? Would it have been a disappointing story if it hadn't involved the old castle, the rain, the lightning, the machines, the monster, and the mad doctor? I don't really think so, not if enough of the themes and imagery were there. I do think that the content I enjoyed in the first half or so of this movie could have been spread more to include the final pieces. That final scene felt almost disconnected from what the rest of the movie achieved. With that being said, I did enjoy Victor Frankenstein. It was generally a good take on the story. The whole Frankenstein's brother bit was probably the worst part because it threatened to change the entire theme of the story--to turn it into something about guilt and regret rather than creation. But the Igor plot line was the best of the movie, a fresh way of looking at the theme of creating identity. No, no, I'm not talking about the new Star Trek movie; I haven't even seen it yet. I'm talking about the movie that bridged the original cast with the cast of The Next Generation. The thing is, I grew up watching this movie from a young age. Young enough that I used to confuse Doctor Crusher and Counselor Troi, or that I simply had no idea what was going on at certain points. In fact, it took me a long time to straighten out the plot simply because I was used to not understanding it. For instance, I remarked a few weeks ago that I had no idea why the script called for Picard's brother and nephew to die, and in such a cruel way, as well. I found it very counter to the episode in the show ("Family" from Season 4) when Picard goes to stay at his brother's house and you see their dynamics and you see what the nephew is like and what he means for the future. It just seemed very random to me for the script to suddenly give word that they had died in a fire. And then I watched the movie again recently and it made complete and perfect sense, so obviously so that I wondered why I hadn't noticed it before. You've probably noticed it before. Because of the Nexus plot line, it was necessary to give Picard something he would regret and want to change, something that he missed and wanted back more than anything. Picard has always been a solitary figure. He has friends and lovers and some manner of family. But he's mostly just a lone figure and he doesn't really form close, lasting relationships other than the work relationships he has with his crew. So the closest thing the script had to draw from was his relationship with his nephew--a relationship that is as much about symbolism as anything else. And the symbolism, in fact, works better. Rene is, symbolically, Picard's future and his home. Rene links Picard to Earth and to France, the place that he enjoyed growing up in (in a way, I think) and the place that he is glad to know is there (even if he doesn't want to be there because he'd rather be out exploring space). And Rene also has his plans to join Starfleet, too, when he grows up; this makes him, quite literally, Picard's future. So to lose Rene is for Picard to lose both his home and his future. It's enough to make him more shattered and uncertain than he has ever been before. It is enough to offer the possibility of temptation from the Nexus. There's also that wonderful line from Soran, when he is trying to convince Picard to let him go back to the research station: "Time is the fire in which we burn. And right now, captain, my time is running out." It's just a phrase Soran was using to express a point, but it resonated exactly with Picard's difficulties at that point (his difficulties with emotion that are reflected so wonderfully in Data's difficulties in handing his newly installed emotion chip). But the Rene plot also does something else: it reinforces the concept of generations that is so strong in this movie. I had watched a couple of episodes of the original Star Trek here and there but it wasn't until I was in college that I watched them all (and enjoyed them, too, I might add). I followed with the movies--and that was when I realized that the original cast was making movies right up into the TNG cast's reign. So it was almost necessary to have a passing of the torch moment. Funny how this movie gained such new meaning and emotion once I had gotten to know the original cast and had watched them work their way through the 80's right into this 1994 movie. It's beautiful, really. One cast passes away into history to make room for the new cast. One generation ends and another begins. (This is the problem with the reboot movies: they ruin the beauty of continuation. It's as if you went and started Doctor Who from the beginning, abandoning the past 50 years of stories and characters. But I digress.) Everyone has their pace, their impact--and time moves on without stopping for anyone. Time did not stop for Rene. And time did not stop for Captain Kirk. But make your life a meaningful one and make a good difference in whatever way you can--that's the message of the movie. Rene is only a reminder. Now that I've finished going through all the truffles I brought back from Santa Fe, I'm starting in on the chocolate bars. First up is a flavored one from the gift shop at El Rancho de las Golondrinas, which is a great spot on the outskirts of Santa Fe for a visit. This chocolate, however, is not made in Santa Fe; it is from the nearby Albuquerque. 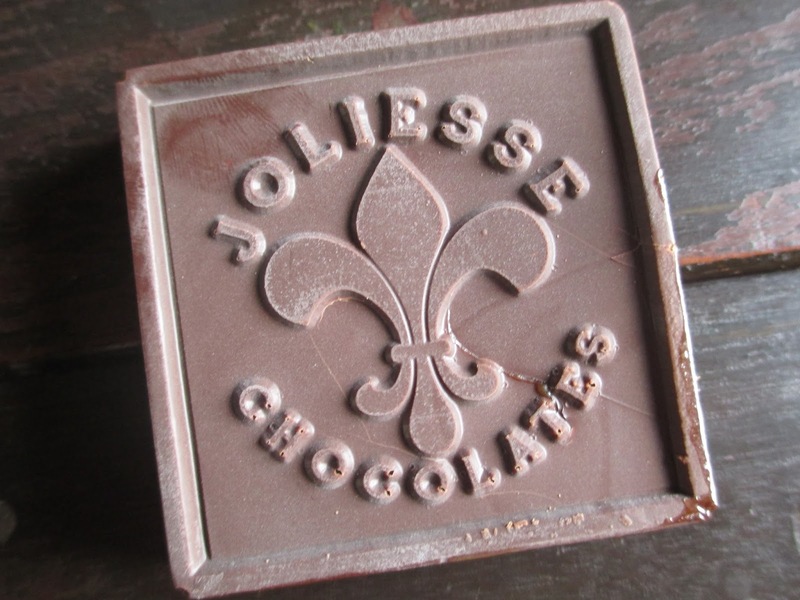 Given that I usually don't spend any time in Albuquerque and therefore have not bothered to look up chocolate shops there, I hadn't heard of Joliesse Chocolates before. But this chocolate passed the ingredients test (no to fillers or artificial junk, yes to real cream and vanilla), which usually bodes well. The gift shop, presumably, chose to carry this particular chocolate because of the lavender. Not only is lavender very Santa Fe, but the ranch also has a lavender festival each year. So it is fitting. But after the wonderful lavender caramel truffle from Chocolate + Cashmere, would this one still satisfy? It turns out, naturally, that this is a very different experience. It's more casual and straightforward and the lavender flavor is a bit different, as well. Abuntantia, the back of the wrapper tells me, is the goddess of the harvest and plenty (cuisine, essentially), with lavender being an important part of cuisine since Roman times. It is a pretty wrapper, with Abundantia's image and a purple background. The chocolate bar is pretty, too, though it had some bloom to it. Again, I can't say if this formed after I purchased the chocolate or after; but as it's merely aesthetic, it isn't a big deal either way. I'm not sure if you can tell from pictures, but this is quite a thick bar, probably double or so the thickness of a regular chocolate bar. It's also square in shape. The overall feel makes it seem quite solid and big, though it's a standard 60 grams. Once again, a possible product of time spent traveling: there as some caramel already leaking out of the chocolate when I unwrapped it. As soon as you bite into the chocolate, the lavender strikes you. It's the fruity and citrusy type of lavender, rather like a Lavender Earl Grey tea. I perhaps prefer the more floral lavender flavor of the aforementioned truffles, but that could be a personal preference. While the lavender is quite a strong flavor, you do get to taste the chocolate as well because you have two thick layers of it, top and bottom with the caramel in the middle. This must be the reason, after all, why the chocolate is so thick. This is a fairly standard decent dark chocolate (it's a 70% cocoa content). No flavor notes, really, nor either bitterness or sweetness. Just chocolate flavor. I'd compare it to Ghirardelli. It's a good chocolate but not a "wow" chocolate. The right thing to pick up and eat right away, as fits in best at the gift shop where I found it. It would be nice for sharing, if the caramel didn't make it messy. So you'll just have to get one all to yourself. It is a little pricey at $6.50, especially if you're not sharing. But you know what, the chocolate is good quality and so is the caramel, and there's a price for all that--and this is a fairly big bar of chocolate. Click here to read my thoughts on the first installment in the Aftermath trilogy. Last fall we had many books released as part of the Journey to the Force Awakens campaign, including Chuck Wendig's Aftermath. While the campaign was exciting, that book was hard for many of us to get into, due in some part to the extensive Interludes showing lots of characters and lots of settings without necessarily uniting it all. And it didn't deliver as much of a prelude to Episode VII as I had hoped for. With that said, I wasn't overly excited for the sequel, Aftermath: Life Debt. But it was hard to not enjoy seeing the Millennium Falcon on the cover. So. I got the book and even put another one I was reading on hold in order to read this one right away. The thing is, there have been so many scattered things going on in my life right now that I just didn't have much time to read. So it's taken me over a month to get through this book. But do you know what? That may have been a good thing because this book was good and it helped to have time to absorb it all better. I see now that Aftermath wasn't Chuck Wendig's fault: that book's fault was a matter of holding back for later. Life Debt delivered all that its predecessor didn't; if you're hesitating on whether or not to read it, definitely read it. By the time I got to this book, I was getting used to the team introduced in Aftermath and I was starting to like them and their dynamics; the way that they come together isn't entirely unlike the crew in Star Wars: Rebels. I started to care about them, so I was finally interested in what was happening to them. And while Mister Bones seemed so random and weird and I just didn't get him in the first book, I really like him now: he's hilarious and cool at the same time. While there were still Interludes in Life Debt, there were not nearly as many as before and they also weren't as random. They were connected more to the main events, although not necessarily in obvious ways at first. The Interludes made more sense this time and felt like parts of the story instead of distractions from it. Ah, yes, and then there are the familiar characters. Leia, Han Solo, and Chewbacca--and Mon Mothma and General Ackbar, in addition to Wedge Antilles from the first book. They're not just on the sidelines, either; they're a big part of the story, especially the second half. That's both welcome as far as enjoyment and insightful as far as hints of what's to come. Now for some semi-spoilers below the break. Click here to read my post on the Kakawa Chocolate House shop and drinking chocolate. Last time I was at Kakawa Chocolate House, I remember that we bought some chili chocolates. This is when chili chocolates were still a new thing to me, so I found it all exciting. But this time I set out to try some of their truffles. After all, if their drinking chocolate is so impressive, their truffles must be, as well, right? And oh, yes, they are. Now, I by no means want to be directly comparing the three types of truffles I bought while in Santa Fe: they each have a different style and were good in their own way. But given that I tried the Kakawa truffles last, they were stunningly sophisticated coming after the more casual truffles from the other two places. When I bought them, the woman helping me asked if I wanted them in a bag or a box. A bag is fine if you're eating them right away, but I got a box since I was planning to bring them home first. 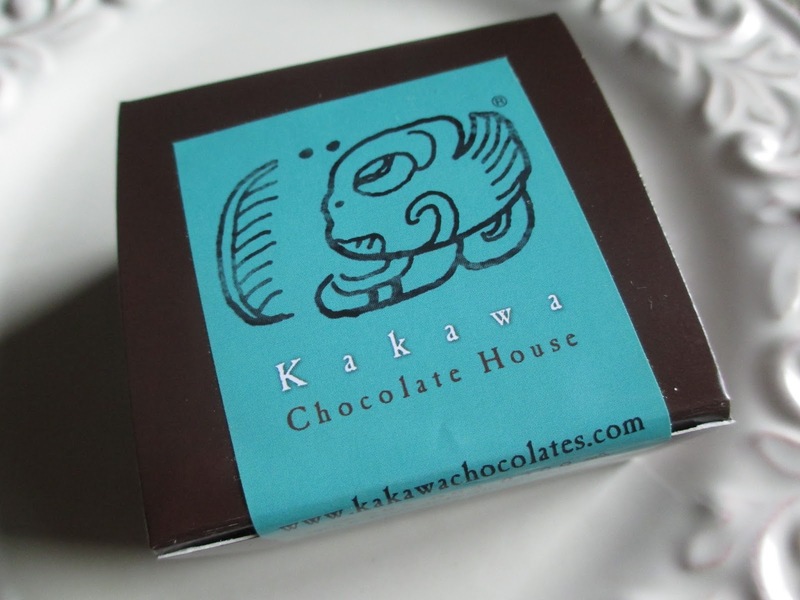 The brown box has a blue Kakawa sticker and also keeps the truffles safe in blue tissue. All very nice. Then I went a few days without seeing the truffles, so they took me by surprise when I saw them. After all, I didn't get that close of a look at them through the case in the shop. 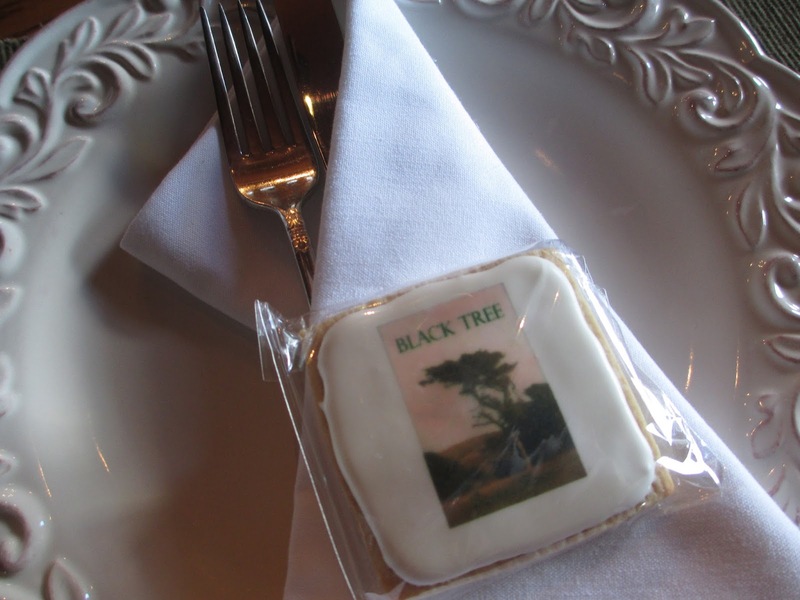 They're sleek and simple with the right touches of embellishment and they give off a rich chocolate aroma. French Dark Truffle - "72% Dark Chocolate, Cream, Milk, Butter, 24K Gold" - With a square shape, this one is plain except for a pattern of the Kakawa Chocolate logo. The effect blends rustic and modern styles. The chocolate smells rich and heady, like a brownie made with lots of top notch chocolate. The bite is fairly soft, and the truffle is rich and smooth in both flavor and texture. There is a little hint of bitterness around the edges, so it's good for dark chocolate lovers, perhaps unlike some of the truffles I've been looking at lately. Somehow you get a taste of cocoa powder as you do with the traditional French truffles that are rolled in cocoa powder. There is still some of the sweetness from the ganache, so the chocolate isn't completely devoid of sweetness; however, you do tend to get more of the light bitterness. It's quite the chocolate hit. Berry Champagne - "72% and 40% Chocolate, Strawberry & Raspberry Puree, Champagne, Butter, Vanilla" - One plain truffle and one flavored truffle for variety. This one is round with just a swipe of gold paint. Once again, this combines the look of old and new and works superbly. When you slice this one open, the ganache inside doesn't look as if it has berries: it looks even in texture and also in its brown color. There is, however, a light berry aroma, and the berry flavor hits instantly on tasting. The strawberry and raspberry are fairly equal in the amount of flavor that they give. I don't know that I necessarily taste the champagne; it could be that the flavor blends in with the raspberries. Of course, you taste the chocolate less in this truffle than in the French. It's still rich, though, coming across a little warmer in flavor and not at all bitter. The ganache is still smooth but thicker. The milk chocolate seems to make this one melt more quickly than the French did, making it vanish rather quickly. The chocolate in here is wonderful, even underneath the berry flavor. The milk chocolate adds in those touches of sweetness along with the berries, and yet it all stays enclosed within the concept of dark chocolate. This makes for a serious effect. In fact, both of these truffles are for when you're serious about chocolate. If you like sweet chocolate or mediocre chocolate, these aren't for you. "Fun" means something different in this context. I don't mean to be strangely blunt or snobby here, but these are just the facts. These are truffles not candies. There are probably a few people who won't appreciate them. But for the rest of us, oh, they're divinity. The chocolate that they use, the textures that they come up with, and the flavors that they put together are simply perfect. So don't stop at the drinking chocolate. Also get at least a couple of truffles to eat later or when you get home (of course, you do want to make sure you don't wait too long to eat them since fresh truffles have short shelf lives). They will help you relive the Kakawa Chocolate House experience of casual sophistication. 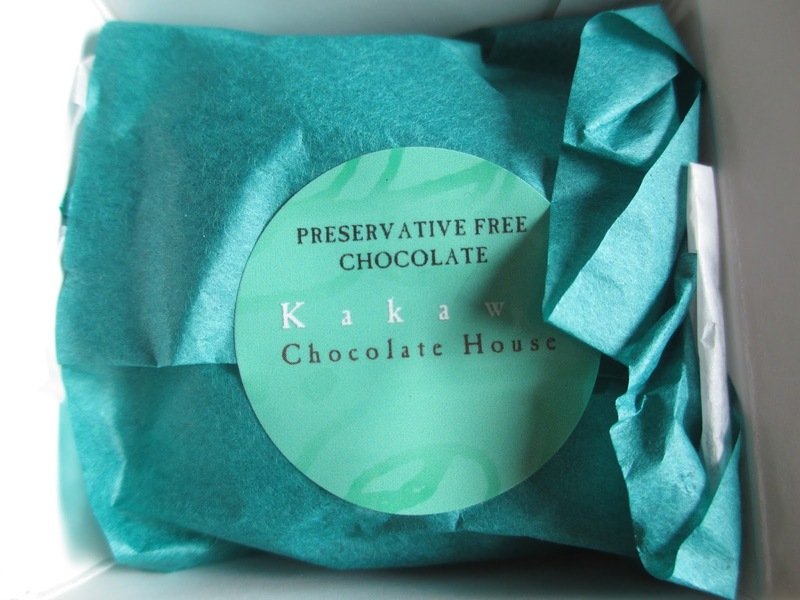 The first time I went to Kakawa Chocolate House, I was enchanted and amazed and excited. This was the time when I was reading chocolate reviews and starting to write my own. In fact, some of my first reviews on Chocablog.com were of chocolate bars that I got at Kakawa Chocolate House. This was the time when the world of chocolate was new and fascinating to me. I remember sitting in there and chatting with the shopkeeper and trying a cacao bean for the first time. That was eight years ago. The second time I went to Kakawa Chocolate House was just a couple of weeks ago. Everything was the same and everything was different. I went by myself this time, walking from the Plaza area (it's about a five to ten minute walk, depending on where you start and how fast you walk). I'd just been to the Georgia O'Keefe Museum, so I was feeling inspired. And the warm afternoon was just starting to cool off from the highest point. Like a traveler approaching a house of hospitality, I reached the small, brown, adobe-style building. From the outside, it seemed mostly unchanged, and it is rather inconspicuous, as most everything in Santa Fe is. Businesses work off of reputation rather than flashy signs. By the way, Kakawa's logo, if you weren't already aware, is the Mayan symbol for chocolate. So let me start from the beginning. Kakawa Chocolate House is basically a coffee shop for chocolate. Their main product is their drinking elixirs, which are nothing like hot chocolate and well worth the time. They also have a case full of chocolates and truffles and another filled with chocolate bars from various fine names, such as Pralus and Michel Cluizel (some of my favorites, which I tried for the first time from here). There were a few new things this time. They now serve their own ice cream, which I probably should have tried, but it was a short trip, so I couldn't work in too many desserts. They also make horchata, chocolate soda, iced mocha, black tea, and lemonade. Enough options for everyone and yet they all sound good. The shop is set up like a coffee shop, too. There are tables and chairs to sit at after you order at the counter. When you walk in, the staff greets you and explains the drinking chocolates to you. (Side note: instead of the one shopkeeper that was there eight years ago, there were three people this time and the shop had quite a few customers.) They'll let you try samples of as many of the elixir flavors as you want; I only tried the European ones, though, because all of the Meso-American ones have coconut and I don't care for coconut. Their flavors have changed quite a bit from what I remember. Instead of Chili, they had the Aztec Warrior. And many of the flavors used to come with dates; I chose the 1692 French, for instance. That gave a welcome sense of the history of chocolate. Some of that still lingers, such as in the Jeffersonian and Marie Antoinette, which both evoke obvious time periods and places. And I believe I did see some of the old flavors available to purchase in bags that you can buy to make at home. The Jeffersonian tasted quite nice, but I chose the Tzul to buy. A small cup is 3 oz. and $3.75 (up 25 cents in eight years), and a large cup is 6 oz. and $6.50. Get a small. While there may be a few people who would want a large, most people will be completely satisfied and probably more satisfied with the small. It's exactly the right amount. The chocolate comes in these wonderful white and blue cups. These cups are also for sale if you just can't resist. I do think I might have to get some someday when I have a little more space. Elegant and rustic at the same time, just like Santa Fe--and just like chocolate, too, honestly. Let me try and describe the texture to you. This chocolate is thick, yes, certainly thicker than grocery store hot chocolates. But not so thick as melted chocolate, nor so thick as to feel partly solid. Just thick enough to have some substance to it. And the thing is, I remembered it being good, but when I sipped some again after eight years, I thought to myself that it was so much better than I remembered. Depending on what flavor you get, it's rich and dark with flavors of sweetness; it is serious but not overpowering. A word of advice: don't be shy about asking to taste samples. They mean it when they say you can taste them all; you don't have to taste them all, but you should make sure that you're getting the right flavor for you. We all have such different tastes, so you want to be sure that you're making the best choice so that you'll enjoy it. The Tzul was an interesting combination of earthiness and femininity. The board describes it as containing 72% chocolate, 36% chocolate, almond milk, and a spice blend. To me, it tasted somewhat of orange. Also of nuts, perhaps almonds (that would be the almond milk). Maybe something like nutmeg. It's an almost sweet drink and it is also mildly dark. It's something you sip quietly and something that makes you feel enriched as you drink it. I was getting pressed for time when I sat down with my cup, so I had just enough time to finish the small cup at my own pace before I needed to leave (this was the afternoon before the Flamenco show at El Farol). And it was just a very pleasant way to finish off my afternoon. Kakawa Chocolate House is the perfect stop for visitors and locals alike, a place you can go to get a quick drink or chocolate or somewhere that you can sit for a while with conversation and drinking chocolate. While I was there, I also picked up two chocolate bars and two truffles. I'll review the truffles next. Todos Santos: Chocolates & Confections is a funny little shop. Around the Plaza area in Santa Fe, it's tucked away in the back of one section: you have to walk past the shops in front and a small garden area to get to it. Now, it is a chocolate shop--but it almost doesn't look like one. It's a tiny space, about the size of a small bedroom. And it's stuffed not just with chocolate but also with all sorts of brightly colored trinkets: squares of cut-out paper hanging in a row, a tree limb with orange and white flowers, and everything else to go with the "All Saints" theme. Take their chocolate case, for instance. While other chocolate shops have sleek cases designed to showcase the chocolate like jewelry, this case is unique in its abundance of colors, textures, and materials. Just look at the different stands and the colorful ribbons on the boxes. Which is not to say that the chocolates fade into the background or are unattractive: they are most certainly still good-looking. Simple designs stand alongside silly items like the little chocolate mice on the top right corner. Before I get to the truffles, though, I'll give one note about the rest of the products for sale. I must have talked about this store years ago but it's time for an update. They have several different brands of chocolate bars (I picked up just one), as well as some other chocolate creations. A bag of chocolate sweets from Valerie Confections in Silverlake (that is, L.A.) greeted me (their rose petal petits fours are the best, by the way). Candies are there, too: pretty berry and fruit candies carefully made. It's mainly all the handmade or otherwise superior quality type of products. You won't find Skittles or Reese's Cups here--because what's the fun in finding those, anyway? For such a small shop, they do have a fairly wide selection. Chances are there will be something you've never seen before, so definitely stop by if you're in the area. Now back to the truffles. I really don't know why I had never tried anything from their case before. Either I used to be more intimidated by cases or I was too focused on trying out new chocolate bars (because, after all, purchases in chocolate shops can really add up if you want to try everything). I made it a point to choose some this time. The one thing that I found odd was the lack of labels in the case. The shopkeeper was happy to name them for me, starting at one end of the shelf and ending at the other. But still, I would think it would be easier for everyone if they simply had labels like they do everywhere else. Enough of that, though, because these chocolates just look gorgeous and I wouldn't want to drown out that simple fact. They're absolutely stellar and sleek with just enough of a touch of fun to their designs. You remove them from all the sensor-overload visuals of the Todos Santos shop and you can really appreciate their look. Mine came in a simple white paper bag instead of a box since I only got two, but at least their little wrapper papers were colorful. Let's start with the Hazelnut one, which is shaped like a rounded, multi-surfaced dome. You might be able to see on the close-up that the shell is milk chocolate with some darker stripes criss-crossing like on a peanut butter cookie. It also happens to form one of the best visuals for a sliced-open truffle: there's a whole hazelnut thrown exactly into the top middle, surrounded by a milk chocolate ganache. Just beautifully formed. In addition to the whole hazelnut, there is also hazelnut flavor infused into the smooth ganache. Not overly sweet for being all milk chocolate, the truffle also has some depth to its flavor. Unless I'm mistaken, the cause for this appears to be in the bottom chocolate layer. It appears that the truffle is sealed off with dark chocolate instead of more milk chocolate. That's an interesting way to combine milk and dark chocolate and get the best of both together without simply melting them together. Now, that whole hazelnut is quite crisp and flavorful; both texture and flavor add to the experience. This truffle is how I want hazelnut and chocolate to work together. This is what I want them to be. Everything is well done here. The other flavor I chose was Espresso. With a beautiful triangle shape stretched out into a sleek and dark truffle with just a sprinkle of gold, this one is quite large. It's easily the size of two other truffles. A gorgeous, silky ganache shows after slicing. Oh, and the aroma, the aroma is divine. Deep chocolate. Straightforward and good. Because of all that soft ganache and because the chocolate shell isn't hard and thick, the bite is very soft. First you taste the chocolate, deep, and then the coffee comes in, dark and fresh. And there's something awesome about biting into this truffle, with all of that soft, soft ganache--I've never come across one so soft, I think. And yet it still tastes rich and deep. I'd love to see an ingredients list for this one: is there some sneaky ingredient in there that shouldn't be in there, or is this achieved all through fresh and pure ingredients? The espresso, I should add, also comes across well. It's exactly the way you would want to taste it. The sheer size of this chocolate once you begin eating it really transforms it into an elegant piece. I'm picturing it sitting on the top tier of an afternoon tea set, above the sandwiches and scones. The flavor and texture together remind me of something elusive, something that I can't quite put my finger on. A dessert, perhaps. After all, if you finish this truffle in one go (which, of course, most everyone will do), it does get a bit sweet. Sweeter than the Hazelnut, I think, unless this is simply because it is bigger. So I'd say the sweetness is balancing out the darkness of the espresso: if you want darkness with the espresso, well, you probably won't be getting that out of this particular truffle. I don't mind, though. When sweetness is carried out in this way, I like it; I just don't like the wrong types of sweetness. Given how much I enjoyed this pair of truffles, I'm left wondering why I didn't get more. The tone really goes back to the tone of the shop: lots of fun stuff to look around at but also some quality to ground the experience. Am I a wanderer? No, I like to be at home. But is there a simultaneous sense of displacement and belonging? Yes, I think so. Born in California but translated to Arizona when I was almost eight, I feel at home here; I feel like I can find and form my identity here. Is it my land, though? I don't entirely know. My family's roots in California only go so deep--one quarter of the roots are more from the South and then the East depending on how far back you go. The rest goes back to Mexico, and Arizona was once Mexico. So even if the people I was specifically descended from did not live in this area, I find that there is a certain logic to my sense of comfort with the Southwest. These types of considerations made their way through my mind as I watched the Flamenco group perform at El Farol in Santa Fe. The last time I was in Santa Fe, I saw Juan Siddi's group, but I found myself enjoying this one much more. Don't get me wrong, Juan Siddi is talented--but I connected with these people more, I think (the general consensus also seemed to be that they traded off more frequently, whereas Siddi took more of the stage). Maybe it was the singer; he reminded me of the Gipsy Kings. When I was very young, my family lived in Alaska for a year. One of the stories from there goes this way. My parents were very excited to find a bunch of Gipsy Kings cassettes at a great discount in a music store there because, apparently, no one in Alaska was interested in something so exotic as gypsy music in Spanish. So the Gipsy Kings were one of the sounds I heard growing up. It's music in Spanish but nothing like what plays on the radio station: it's folk music. It's about guitars and groups and it has this theme of wandering and expressing that transcends the language (because, of course, I can only translate some of it). So while I was sitting there in Santa Fe, watching the people in this group take turns dancing on the small stage while the singer went through various songs, I was partly transported back to my younger self listening to the Gipsy Kings. What I mean here is that I felt like I was transcending barriers and definitions. I felt like, if I'm supposed to invest more in things like "heritage" and "culture" that people talk about, this is where I want to search for it. I want to go back to the deeper roots, the ones that connect back with the land and with this sense of the organic. I felt very cool about Santa Fe nightlife. I'd just enjoyed myself at the opera the night before. Now here I was, dinner at El Farol followed by their Flamenco show followed by a little time spent by the bar, where a band was performing. This was culture that I could take part in and feel invested in. Gypsies are wanderers who carry their homes with them, in who they are. And as I sat listening to the music that night and watching the dancing, I felt the passion of their performance. I was reminded that I, too, can decide what my passion is and portray that. Because the United States is such a new country, we are all displaced here--but if we continue to make the right connections and to listen to the land in which we live and to take part in the culture that we see and feel, then we will realize that we are at home. The wanderers have made a circle and ended up exactly where they need to be.